Very quickly, I want to offer major props to Timothy Lewis for the inspiration for this episode. Find him on Twitter here. Okay, to the episode! This episode opens with JVL sitting in a waiting room. There’s a stack of magazines on the table next to him which he would never in a million years touch – what with the germs and all. You do realize many people don’t wash their hands after going to the bathroom. And then they touch doorknobs too, which is why JVL carries in his front pocket – not his back pocket…that is bad for your back – a handkerchief which he uses to open doors and touch anything that anyone would have touched. A door opens, and JVL looks up from his leather binder where it appears he has been studying notes of some sort. A receptionist ushers him into a conference room where two men stand up to greet him. Mort is played by Jeff Garlin. Mort: Jonathan, this is my boss, Wheelock. I’ve told you about him. JVL shakes his hand, then surreptitiously glances at his hand with a rapidly rising panic. He then looks off into the middle distance just briefly. It’s almost as if he’s imagining something. Perhaps it’s a future that follows a successful meeting. Perhaps it’s a future of a Howard Hughes-like existence of plastic covered furniture and all that. JVL takes a deep breath and takes a seat. Wheelock: So, Mort tells me you’ve got something to pitch us. An idea for a toy? JVL: Not just a toy, a whole set of toys. Wheelock: And Mort tells me you’re the host of a podcast. JVL: Not just any podcast. Everyone’s got a podcast these days. 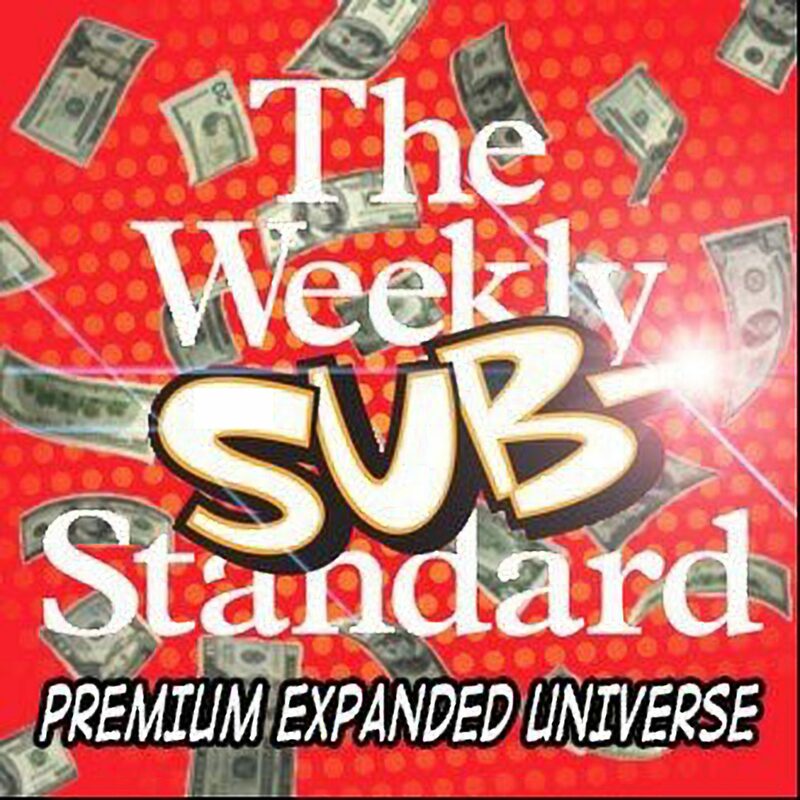 We have a hit podcast, and The Weekly Substandard moves product. Mort: That’s the name of the show! JVL: (getting into pitch mode now) Wheelock, the days of the action figures based on movie characters are over. JVL: Sure, Toys R Us is on the brink of bankruptcy. JVL: (cuts him off) We don’t need to talk about Lord Bezos right now. The point is, why buy a toy based on a movie when you could buy a toy based on a movie reviewer? Wheelock: Is that really his name? JVL: Nevermind that. The three of us review movies on our podcast. And you could make toys based on us! The possibilities are endless! Reviews, rankings, wood shop updates, pop culture references – what child wouldn’t want access to that world? JVL: Maybe you need to see a few of my prototypes in action. Here’s early morning JVL. He’s got a zip-up hoodie on and he’s headed to the gym at 4:00 AM for a run, and he’s going to watch a movie on his phone in portrait mode – just as the filmmakers intended. Wheelock: Why are you going to the gym at 4:00 AM? (to Mort) Why’s he going to the gym at 4:00 AM? JVL: (powering through) Here’s JVL at work. He’s writing the next article that’s going to go viral like my article on why the Empire is good in the Star Wars universe. Or maybe he’s writing his next book. Or maybe he’s just avoiding his family. No one knows why he’s at the office. Wheelock: He looks exactly like early morning JVL. JVL: (a little testy) Yes, I wear zip-up hoodies a lot. I’m basically like Mark Zuckerberg. Wheelock: Minus a few billion dollars. JVL: Doctor. I misspoke. Doctor JVL. JVL: Nothing. Look at that white coat. Would a non-doctor wear a white coat? Wheelock: I don’t know. Why don’t you show us some other characters? JVL: Alright. This is the Sonny Bunch. Mort: You’re going to like this one. Wheelock: Why’s his skin so white? JVL: Ah, yes, you’ve noticed. He doesn’t like to go outside. Look what happens when he does. Mort: His skin burns right away! So authentic. Show Sonny in the favela. Show him what happens when Sonny touches sand. JVL: No, that’s not necessary. Plus my lawyers tell me George Lucas owns the rights to all that hating sand stuff. But I have this. Here’s Sonny in his basement favela. Wheelock: What’s in his glass? JVL: Expensive bourbon. Well, that’s what he tells people. But he drinks Wild Turkey. He’s doing a whole elitist/populist thing. It’s very confusing. He has elite tastes in pop culture, but when it comes to food and drink – well, just food – he pretends to like Taco Bell, Chili’s, and McDonalds. Wheelock: I honestly don’t care what he pretends to like. JVL: Ok, I have a lot more to show you. I have accessories. Here’s Sonny watching The Walking Dead on his TV, and he’s polishing his shoes. (with growing intensity) However, the people who made my cedar shoe plank accessories didn’t make two piece planks that expand when they’re inserted. (Bleep)-ing amateurs. JVL: Well, I just want you to know that we have all sorts of ways for you to make money. I mean, what’s the best way to make money with action figures? JVL: (cuts him off) Special edition releases. Here we have Special Edition Rotten Tomatoes Critic Sonny Bunch at a movie screening with an improperly masked screen. Mort: Look at the rage on his face! I love it! Tell him about your Vic figures. JVL: Okay, here’s Victorino Matus. Wheelock: Why’s he wearing that giant thing on his head? Wheelock: That thing on his head. It’s giant. JVL: No, that is his head. Wheelock: But how? His neck must be unbelievably sore from supporting that head. Does he have to special order his shirts? Or are they custom shirts? JVL: I’ve never asked. But this is Chinese buffet Vic. Check this out. JVL: That’s right. After the second trip to the buffet, if Vi c needs more room he just loosens his pants. Wheelock: Why would he do that? Why wouldn’t he just stop eating? JVL: That’s not important. He just keeps eating. That’s all you need to know. And here’s special edition Vic with a mustache, wig, and glasses for his Gene Shalit reviews. JVL: I can see I’m losing you. Let me show you a few figures on the periphery of The Weekly Substandard. Here’s Captain Bill Dwyer. Wheelock: Whoa. Are his muscles this big in real life? JVL: No. They’re bigger actually. These are prototypes. They’re not anatomically accurate. I was hoping for better work, but that’s why I’m coming to you. Wheelock: (with no sign of a smile at all) You said you had other peripheral figures? JVL: (starting to sweat a little as he’s getting no sign of approval from Wheelock) Um, here’s the exclusive Mike Warren figure. Mulch sold separately. JVL: Here’s Hannah Yoest. It’s a throwback to the short Facebook Live era. Mort: (interrupting) I think that we all signed non-disclosure agreements on that case. Wheelock: What I’m saying is, we want to be in business with the…what was it called again? JVL: The Substandard. Yes. I see what you mean. The world has changed. Let me show you my last special edition figure. This is my Jony Ive JVL figure. He’s presenting the iPencil. And here are Vic and Sonny, ruining the joke. Wheelock: Oh, we can’t do Jony Ive. We have a non-compete agreement with Apple, and I lost a bet to Steve Jobs’ widow. It’s a whole thing. Mort: Why was Jony Ive a non-negotiable? JVL: It just is. No Jony Ive, no deal. Mort: Okay, how about another company? You could try Hasbro. Mort: I don’t know what you’re saying! JVL: Oh, yeah, I thought it was Hasbro too. But they’ve changed their name to Hasbruh to reflect the personality of their board of directors and their new CEO. Mort: I didn’t hear that. JVL: Yeah, I already met with them. It was…horrible. Cut to JVL in a meeting with frat-bros. Bad music is blaring. The frat bros at Hasbruh have impressive layering, but it’s all just polo shirts. Like four polo shirts with popped collars – one on top of the other. There are clouds of marijuana smoke in the boardroom. CEO: (shouting over the music) You have a podcast? CEO: Like, about Bud Light or something? Dilly dilly!